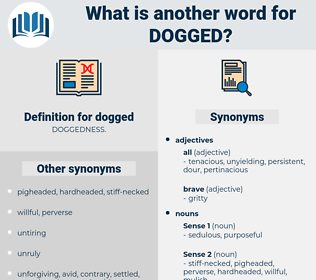 What is another word for dogged? Prosecuted, persecuted, plagued, pursued, desired, ravaged, harassed, hunted, beset, sought, haunted. unstable, flexible, yielding, undetermined, irresolute, soft, weak, indifferent, Surrendering, unreliable. invertebrate, persuadable, perfidious, bland, gentle, receptive, reasonable, treacherous, acquiescent, placable, good-natured, benignant, genial, hesitating, complaisant, spineless, subservient, sympathetic, false, complying, slack, hesitant, impotent, loving, indulgent, kind, amiable, friendly, disloyal, manageable, vacillating, inconstant, traitorous, accepting, pleasant, temperate, willing, tender, governable, fickle, responsive, wavering, obliging, faithless, mild, softening, slackening, slavish, faltering.
" It is Ramiro," she whispered, " Ramiro the spy, the man who dogged my father at The Hague." Then, jus' as I got so I could stamp m' boots on th' ground an' expect to stand straight up in 'em, this here Yankee patrol came 'long an' dogged me right into a bunch o' our boys they had rounded up. dissociate, do-si-do, dig out, disquieted, dasyatidae, dagda, dytiscidae, decoct, dockside, desist, decide, dicky-seat, dictate, dakoity, digitate, duct, dedicate, decked, dickie-seat, dust, detested, dead weight, duck shot, deject, desiccate, dioxide, dissected, dighted, deceased, doughty, desuetude, dickhead, disgusted, disused, dazed, detached, dogtooth, digit, due south, dacite, deceit, die-cast, diskette, death squad, discoid, due east, dosed, detoxicate, decayed, dictated, dished, dakoit, degust, dissuade, dogwood, dish out, dicot, dakota, deduct, diseased, detected, disguised, dejected, decade, diazoxide, disquietude, deist, duckweed, decided, disassociate, dodge city, death seat, decussate, De Sade, dedicated, dugout, decode, detest, dickey-seat, dissect, dog-sized, dacoit, due west, dacoity, dusty, dashed, desiccated, deuced, decked out, digest, detect, deck out, dead set, decidua, destitute, do good, dziggetai, ducat, disquiet, digested, disgust, docket, death's head.